Home / National Assembly / Archive by category "National Assembly Session Report"
ISLAMABAD, March 8, 2019: The National Assembly did not address 38 percent of the agenda during eighth session that continued between February 20 and March 6, 2019. 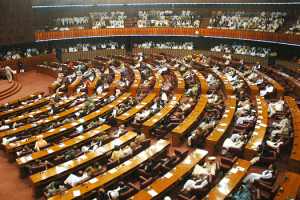 The House spent seven hours and 55 minutes (62 percent) on various Points of Order (POs) while debating the Indian violation of Pakistani airspace, arrest of the Sindh Assembly Speaker and political and other issues. The proceedings remained suspended for three hours and 36 minutes (22 percent) due to the protests, prayers breaks and lack of quorum. Islamabad, December 21, 2017: The National Assembly could not address its scheduled business during 50th session that ended on December 21, 2017. The eleven-sitting session had five government bills and heavy Private Members’ business on the agenda. Four government bills were passed while one was referred to the relevant committee. However, the House did not take up any agenda item except one Calling Attention Notice appearing on the Private Members’ day. The Question-Hour was also held only in three sittings during the entire session. 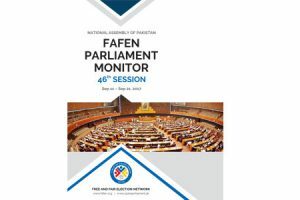 ISLAMABAD, October 12, 2017: The National Assembly transacted 73% of the scheduled business during its 47th session while the proceedings marked an improvement with regards to the quorum and the attendance of lawmakers, observes Free and Fair Election Network in its session report based on direct observation of the House proceedings. 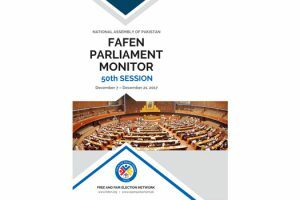 ISLAMABAD, September 25, 2017: The National Assembly left its 38% agenda unaddressed amidst low attendance of lawmakers and frequent adjournments due to lack of quorum during 46th session, observes the Free and Fair Election Network in its session report based on the direct observation of the House proceedings. ISLAMABAD, June 15, 2017: The National Assembly passed the Federal Budget for the Financial Year 2017-18 during its 43rd session that spanned over 15 sittings. It was the fifth budget of the ruling party during the term of 14th National Assembly that was debated and passed amidst opposition’s boycott.